Buy live Venustus Cichlids from a trusted breeder. All orders shipped to your door with a live arrival guarantee. Any fish that are DOA can be replaced or refunded. The Nimbochromis venustus or more commonly known as the Giraffe Hap or Venustus cichlid, is a species of Haplochromis from Lake Malawi, which is native to the deeper, rocky regions of Lake Malawi in Africa. This species is fairly common in the hobby due to its colors and ease of keeping. Males will develop a metallic blue color on their face, and their body will develop a yellowish green color with dark black patches (much like a giraffe). They also display a yellow blaze on the top of their head and edge of their dorsal fin. Females have a yellow body with brown patches. Males can get to be about 10" - 11" in length and females will be slightly smaller. Venustus cichlids are one of the larger and more aggressive Haps found in the hobby. A dominant male will show high levels of aggression towards other more passive species and may hurt or kill them. They will also show increased levels of aggression when spawning. 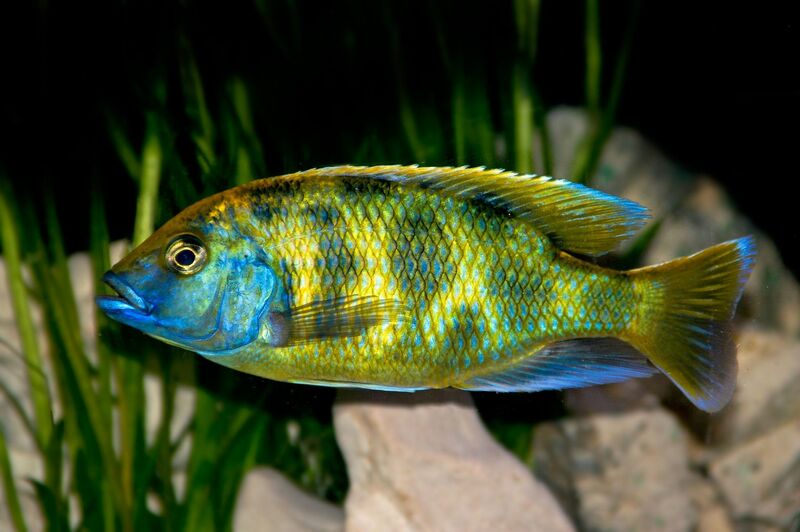 Some compatible cichlid species are larger, more aggressive Haplochromis like the Lethrinops intermedius, the Electric Blue Ahli, and the Protomelas taeniolatus Red Empress. Nimbochromis venustus cichlids are native to the hard alkaline waters of Lake Malawi in Africa. Ideal water conditions in a home aquarium are similar to their natural habitat, and will allow these fish to display their best colors. The water temperature should be between 78 - 82°F with a pH between 7.8 - 8.6. Additives like Cichlid Lake Salt and Malawi/Victoria Buffer will condition the aquarium water for African cichlids. The aquarium substrate should be sand or fine gravel, and plenty of rocks and caves should be provided to allow these fish to claim territories or seek protection. Nimbochromis venustus cichlids are carnivores/piscovores and should be fed a variety of foods that contain a good amount of protein. Plankton based flakes and commercially prepared cichlid pellets mixed with live (or frozen) foods, are good choices for their diet. Such foods will help bring out their metallic blue, yellow blaze and yellowish green colors. Here is a nice looking group of Nimbochromis Venustus cichlids. check out the colors on some of these beautiful fish! The Giraffe Hap or Venustus cichlid is sexually dimorphic. Males will display the yellowish green, yellow blaze, and metallic blue colors, while females remain yellow with brown patches. Males will also get larger than females. Like most Lake Malawi cichlids, the Nimbochromis venustus is a mouthbrooder. While spawning, a female will pick up and hold the eggs in her mouth to protect them. Females may continue to carry the eggs and fry in their mouth for two weeks or longer. It is a good idea to keep several females with one male when breeding. This will help spread out any aggression displayed by the male. All Lake Malawi Haplochromis species will hybridize with other closely related species. If you want to avoid hybridization, the Nimbochromis venustus cichlid should not be kept with Nimbochromis livingstonii, or the Nimbochromis fuscotaeniatus.